Perhaps the most radical changes are structural. The First Department has now established two Attorney Grievance Committees (heretofore, there was only one, the Departmental Disciplinary Committee (DDC)), each consisting of 21 members, of which at least three must be non-lawyers residing or working in the First Department. 22 NYCRR §603.4(a)(1) and (2). Each of the Attorney Grievance Committees shall have a chairperson and a vice-chairperson who must be lawyers. 22 NYCRR §603.4(a)(3). Every member will serve for a three-year term and is eligible for reappointment for not more than one additional term of three years. 22 NYCRR §603.4(a)(2). The Committees also have the power to appoint their members to subcommittees. 22 NYCRR §603.4(a)(1). These changes effectively abolish the former organizational arrangement in two important ways: (1) by creating two working committees in place of the previous, single committee—which had a chairperson, 10 Policy Committee members, and approximately 48 other members; and, (2) by eliminating the Policy Committee (i.e., the executive committee), to be replaced by, as noted, two chairpersons, two vice-chairpersons, and subcommittees. The First Department rules do not specify what functions the subcommittees are to perform; presumably they will review individual cases and then recommend dispositions to the full Committees. The other important alterations relate to meetings, quorums and, pursuant to the statewide rules, informal determinations. 22 NYCRR §603.4(b); 22 NYCRR §1240.7. Under the old system in the First Department, the DDC met no more than once a year as a Committee of the whole. However, the Policy Committee generally convened monthly. Approval of Formal Charges, or the issuance of Admonitions and Letters of Dismissal with Guidance, were authorized by two members of the Policy Committee, while dismissals of complaints could be confirmed by a single member of the DDC. This has all been revised. Each of the two Attorney Grievance Committees must now meet not less frequently than every other month. 22 NYCRR §603.4(b)(1). Two-thirds of the members shall constitute a quorum. 22 NYCRR §603.4(b)(2). Most critically, “all action” shall require the affirmative vote of at least a majority of the members present. 22 NYCRR §603.4(b)(2). In other words, at least 14 members must be present, and no less than eight members are required to approve any disposition (action). While this general structure, and the just-described procedures, were routine in the other Departments, until the advent of the new, uniform statewide rules the First Department’s grievance system had never conducted business in this way since its inception in the late 1970s. Many years ago the DDC informally employed pro bono special counsel to assist in the investigation and prosecution of complaints requiring formal charges and a hearing. This was largely an effort to reduce a backlog of serious cases. While the program worked well, for unspecified reasons it was discontinued after 1998. The amended First Department rules have revived and formally recognized the use of pro bono special counsel upon an initial determination by the Chief Counsel and approval by the Committee Chairperson and the court. 22 NYCRR §603.4(c). This is an unexpected and welcome development, one that can only benefit the bar and the public. While incorporating by reference the statewide rule concerning formal proceedings (Proceedings in the Appellate Division), 22 NYCRR §1240.8, the First Department has filled in certain gaps and amplified several procedures. Appearances. While the statewide rules provide that “the Court shall permit or require such appearances as it deems necessary in each case,” 22 NYCRR §1240.8(a)(1), the First Department rules require counsel for a respondent to file with the court and the Chief Attorney a formal notice of appearance, which notice must provide adequate contact information for both counsel and respondent. 22 NYCRR §603.8(a)(2). Similarly, pro se respondents must file with the court and the Chief Attorney an address to which notices and other communications may be sent, as well as a telephone number and email address. 22 NYCRR §603.8(a)(1). Requests for Extensions of Time. The First Department rules carry forward the prior policy that disciplinary matters shall be granted a preference by the court, and mandate that any requests for extensions of time periods set forth in the statewide rules must be made in writing to the court and “determined by a justice of the Court upon good cause shown.” 22 NYCRR §603.8(a)(3). Needless to say, this reflects the court’s ultra concern about delays. Pleadings. The statewide rules indicate that formal disciplinary proceedings will consist of three basic pleadings: (1) a notice of petition and petition; (2) an answer; and (3) a reply (if appropriate). 22 NYCRR §1240.8(a)(1). The First Department rules more specifically spell out the required content of the basic pleadings. Thus, the petition shall set forth the charges of misconduct, the disciplinary rules alleged to have been violated, and in appropriate cases, the fact that the Committee will seek restitution per section 90(6-a)(a) of the Judiciary Law. 22 NYCRR §603.8(b)(2). As for the answer, it must respond specifically (by admissions, denials, or otherwise) to each allegation of the petition, shall assert all affirmative defenses, and may include matters in mitigation. 22 NYCRR §603.8(b)(3). Motions. Regarding motions, the statewide rules defer to the rules of the Appellate Divisions, stating that unless otherwise specified, “applications and motions shall be made in accordance with the rules of the Court in which the proceeding is pending.” 22 NYCRR §1240.8(c). The First Department rules, in turn, provide, in pertinent part, that where the court has appointed a referee to hear and report, “the Court may refer any pending motion or application in that proceeding to the referee for determination.” 22 NYCRR §603.8(c)(2). Evidence. The statewide rules do not contain a provision addressing the rules of evidence. 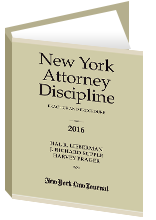 Thus, in New York, there are still no uniform rules with respect to reception of evidence in attorney discipline cases. Under the former departmental rules, only the First Department had a rule that concerned the admissibility of evidence, and the amended First Department rules have retained the general rule that “[a]ll evidence which the referee deems relevant, competent and not privileged shall be admissible.” 22 NYCRR §603.8-a(l)(1). Similarly, with regard to “reception and ruling on evidence,” the amended First Department rules, like the former rules, provide that “[w]hen objections to the admission or exclusion of evidence are made, the grounds relied upon shall be stated. Formal exceptions are unnecessary. The referee shall rule on the admissibility of all evidence.” 22 NYCRR §603.8-a(m). Plainly, however, different referees may have very different standards. In sum, there is no consistent governing standard, either statewide or within the First Department (or within the other Departments), with respect to reception of evidence, including hearsay evidence. Bifurcation. No provision is made in the statewide rules for bifurcation. In bifurcated proceedings, the parties try the merits first. Only if the referee sustains one or more charges of ethical misconduct do the parties proceed to the hearing’s second stage, devoted to an inquiry on sanction, during which they may present evidence in mitigation or aggravation. Practically speaking, bifurcation is designed to protect the rights of the respondent. Notably, the hearing’s initial phase proceeds unimpeded by staff counsel’s submission of evidence in aggravation, such as the respondent’s prior disciplinary history, if any. Under the former departmental rules, hearings pursuant to formal charges in the First Department were bifurcated, and the amended First Department rules, unlike the statewide rules, continue to provide for bifurcated formal proceedings. 22 NYCRR §603.8-a(t)(1). The first part only involves the respondent’s alleged liability as to one or more of the charges. At the conclusion of the testimony and following the presentation of oral arguments, the referee determines whether an inquiry as to sanction is required. Id. If so, the referee sets forth on the record the charges that are sustained. Id. The so-called sanction phase may commence immediately upon the conclusion of oral arguments concerning liability, but in no event later than seven days from the conclusion of oral arguments. Id. In short, if the referee sustains none of the charges, the referee advises the parties in writing or on the record, and that ends the hearing. Id. If, on the other hand, the referee sustains any charge, the parties proceed to the hearing’s second stage, during which they can present evidence in mitigation or aggravation. Id. The First Department has a long history of detailed rules of procedure in attorney disciplinary matters, particularly as compared to the other Departments’ more sparse rules. The new (amended) First Department rules helpfully carry on this tradition.